Horses have many endearing features, but the way in which they graze their pastures is not among them. They are known as selective grazers. If they come across a patch of succulent, fresh grass which appeals to their tastes, they’ll munch it down with gusto. What’s on the menu tomorrow? That’s the owner’s problem. If you’re trying to keep horses on limited acreage, it takes knowledge, guile, and cunning to keep your equine friends fed, footloose, and fancy free. Margins for error are small. Get it wrong and your supplementary feed bill will be sky-high for eight months of the year. Get it right and you can keep your feed bill at reasonable levels and maintain your horse on quality grass for a good portion of the year. Generally, with excellent management, one horse can be kept on as little as 0.4 hectares (one acre). Life will be a lot easier at one horse on 0.8 hectares (two acres). If running horses together, an owner would be doing exceptionally well to maintain a ratio of one horse per 0.4 hectares (one acre). In a year, a horse will chew through about 11 hectares of pasture. If you’re under grazing pressure, you’ve got to do everything you can to keep good quality grass growing. Horses are great at making mud. On average, they weigh around 500kg and their hooves chew up wet ground very efficiently. Whereas your average cattlebeast splits its day between eating, resting, chewing cud, and visiting the water trough, your average horse has a definite “boy racer” attitude to life. There’s nothing like a drag race up the paddock to liven up the morning, and if you can throw in a sliding stop at the end on rain-sodden ground, all the better. Keep your horse off sodden pasture whenever possible to keep mud to a minimum. Keep hay and other feed off the ground, as this reduces the chance of your horse ingesting intestinal parasites from dung. Pick up manure and compost it. Create a pen with a mud-proof base where your horse can reside when conditions in the paddock are unsuitable. Be vigilant about worming, and change your wormer occasionally. Shut up your horse or pony before the pasture is overgrazed, otherwise the grass will be much slower to recover. Try to keep the grass at least 7.5cm long. Treat your grass as a crop and follow strategies that will minimise weed infestation. Organise a soil test and apply appropriate fertilizers. Never introduce sudden feed changes as this can cause colic. Change the feeding programme gradually over several days. Always break feed (rotational grazing), and don’t let a horse revisit grazed pasture until it has recovered. Where possible, feed grass in its leafy stage, before it becomes mature and stemmy. Horses will be able to get more energy from it. Make no mistake. Mud is the number one enemy. It mixes with manure and the resulting soup encourages the growth of bacteria. Insects, including flies, will find it a great breeding ground. It causes soil compaction and grass will be slow to come away. Worse still, there’s a chance that weeds with a preference for compacted soils will get a head-start on the grass and take over. 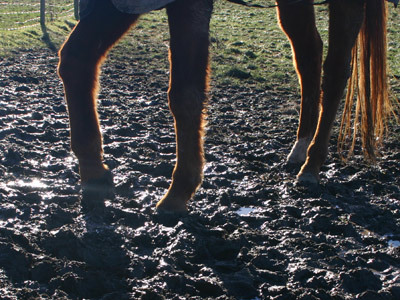 Standing in mud is bad for a horse’s feet and can cause bacterial infections. It’s also slippery and increases the risk of an accident. The solution is an important part of managing horses on small properties. You need to fence off a separate small area of your paddock where you can keep your horse when pasture conditions are unsuitable. It needs to be fenced safely and provide the horse with reasonable room – at least twice the size of a loose box, preferably more. The bigger the area, the happier your horse will be, but you face the cost of mud-proofing the entire surface. Keeping a horse off sodden pasture will not only be better for the horse, but it minimises the amount of mud created and reduces soil compaction. By creating a safe lock-up area with a mud-free footing, you can regulate the amount of time a horse spends on grass. Cover it with a thick layer of material to give the horse a good, mud-free footing. The cheapest will be bark, wood chips, or post peelings. You will probably need a layer 20cm thick to prevent making mud. Wood products also help reduce urine odours. They will gradually compact down and rot, so you will have to top it up from time to time, perhaps once a year, depending upon weather and use. Gravel and sand-gravel mixes can also been used, but be sure they’re not too rough on a horse’s feet. Never feed a horse off such a surface, as serious digestive problems – such as sand colic – can result. If your budget can cope, weed-matting underneath the footing material will prolong its life and reduce the chances of making mud. Consider the best spot for the lock-up pen. Is there natural shelter that can be taken advantage of? Higher or free-draining ground you can use? Don’t forget a reliable water supply. Some may consider shutting up their horse or pony for long periods to be unkind, but it’s arguably a better fate than a permanent winter plug through bacteria-laden mud trying to eat grass that’s been grazed too short. Naturally, a horse will require a diet of good quality hay and other supplementary feed during the periods of confinement. As pasture conditions improve and dry out, you can allow grazing for longer periods before a return to the pen. People in frost-prone areas are also wise to keep horses off the ground on a chilly morning, as walking on frosted grass can easily kill it. If you have an equine companion who gets a little porky on spring grass, the little outdoor horse apartment will serve doubly well when the green stuff is too abundant. It will also prove handy if you have a sick horse in need of confinement. What about the dung? If you’re under grazing pressure, there is little choice but to pick it up. Horses are reluctant to eat around their dung, so the last thing you want to do is reduce useable grazing land further by having horses declare “no-go” zones. Forcing horses to graze near dung greatly increases the chance of them picking up internal parasites. The best thing to do with the collected dung is compost it. If you do it properly, the heat will destroy the parasites and eggs. The key is ensuring at least half your compost heap is green waste (lawn clippings and the like). If conditions are wet, you’re best to cover your compost heap to reduce heat loss, and prevent rain leaching nutrients into the runoff water. Once well composted, it can be returned to the pasture to encourage more grass growth, or used on your garden. Harrowing is an efficient way of dealing with dung, but the pasture will need a rest afterwards of some months while the manure breaks down. Breaking up the lumps of manure in this way exposes the parasites to the elements, making it harder for them to survive and re-infect animals. Harrowing is not usually a feasible option if grazing land is short. Grass will recover much quicker if it’s not grazed too short. With a mud-management plan in place, the next battle is growing a decent field of grass. Your grass is a crop. You’re no different to the farmer down the road growing barley. Both of you want a good yield with as few weeds as possible. Horses are fussy grazers and have a strong preference for grasses. They tend to ignore broadleaf species. This means they’ll keep munching on the good stuff while undesirable plants flourish. You only need to shut up a fat pony for a couple of days on a small area to see how efficiently a horse can vacuum up every blade of grass. Horses are one of the world’s most efficient grazing animals. Grass that is overgrazed will be slow to regenerate, opening the door to yet more pesky weeds. Eventually, the paddock will become horse sour. The best defence is to keep a healthy, thick layer of grass. Thick grass makes it tougher for weeds to take hold. If you prevent horses from grazing it below about 7.5cm, the grass will also be much quicker to regenerate – again, beating back weedy invaders. The best way to manage grazing is with a portable electric fence unit and a few pigtail standards. Work it in such a way that the horse eats out an area and moves on. Don’t allow it to revisit the area once the grass is down to the magic 7.5cm mark. It’s essential that eaten-down areas be given time to recover. Weeds will find it tough to grow through a thick sward of grass. Don’t fix in your mind that you’ll move the horses on to the next area after a day or two days: judge it by the grass length, not the calendar. Equally critical is maintaining the right soil conditions for growing grass. Taking off the manure is all well and good, but you’ll end up growing less grass each year unless you replace it with fertilizer. A soil sample can be tested for as little as $50 and plant matter for about $85. You can then talk to your local fertilizer supplier about the deficiencies and what you can apply to maximize long-term grass growth. You may think you’re saving money by not doing a soil test, but there’s a good chance you’ll end up applying fertilizers you may not need, and still not addressing one or more key deficiencies. Some fertilizers require animals to be kept off the pasture for a little while, sometimes only until the first dew. The main issue is fertilizer dust, which can irritate the lungs. Check with the supplier. If you think fertilizer is not worth the cost, chances are you’ll finish up spending the money in supplementary feed to make up for your poor grass growth. Your horse would prefer the grass. The quality of the grass fed to a horse will make a huge difference to its ability to use the energy it contains. Horses do not digest grass nearly as well as cattle, which are well equipped to process rich dairy pasture. Horse owners can easily tell from the loose nature of their horse’s droppings when the feed is becoming too rich. However, when grasses become mature (with lots of stem), horses fall off the pace even more. Cattle’s ability to extract energy from stemmy forage as opposed to leafy forage drops by only two or three per cent, whereas horses drop by 20 per cent or more. This means you’ll deliver much more energy if your horse is on leafy grass, rather than mature, stemmy pasture. On good leafy grass your horse will be able to extract a little more than 50 per cent of the energy available in it. If it’s stemmy feed, your horse may be lucky to get 30 per cent of the available energy. Ragwort should be removed from paddocks where horses graze. A well nourished, thick paddock of grass will do a good job of repelling weeds. Mowing can also be a useful tool, but never below the 7.5cm mark. This will help prevent grass from developing seed heads and becoming dormant. In effect, you’re encouraging it to grow. Weed-pulling may not be much fun, but your horse will thank you. Herbicides may be an option for bad paddocks but take care – read the instructions, wear the right safety gear, watch for spray drift, and ensure that you follow any grazing restrictions stated by the manufacturer. When temperatures are warmer and soil-moisture levels are right, you have the option of sowing grass seed. Completely resowing a paddock involves cost and planning. Most old pastures will need a good dosing of lime, fertilizer, and spraying off. You will be wise to address soil deficiencies up to a year before sowing new grass. Do not attempt to reseed the entire pasture at one time. Horses must be removed until the plants become adequately established to withstand grazing. The biggest delay is not so much in growing the grass, but allowing the root structure to get strong enough to withstand animals pulling it out roots and all. A horse owner with limited pasture is unlikely to be able to afford this loss of grazing. The alternative is to broadcast grass seed in the spring, paying particular attention to thin or bare patches. If soil moisture is adequate, you should get a reasonable strike. The kind of grass-seed mix will very much depend on the soil type (heavy or free-draining? ), the amount of rainfall, and whether the area is prone to summer drought. Make it clear to your seed merchant that you’re growing grass for horses, not dairy cows. You may choose to use a low-endophyte grass variety if grass staggers is a problem in your area. There are also mixes available which introduce horse-friendly “weeds”. Be vigilant about deworming. Using dewormers at the recommended intervals helps in breaking the parasite cycle, and reduces the rate of re-infection. It’s important to occasionally rotate your dewormers to reduce the chances of parasites building up a chemical resistance. Make sure you’re changing the active worming agent, and not just the brand. Not all dewormers work against all parasites, so read the labels carefully and be aware of which worms you’re dosing for, and which ones you’re not. This may well have a bearing on the kind of dewormer you use next time. Horses are most at ease in a daily routine. Try to feed at the same times, and, if your horse is getting only part of the day on its paddock, be consistent and make this part of your horse’s programme – as far as the weather will allow. It’s unwise to make sudden changes to your horse’s feeding programme, as colic can result. Don’t switch it from an all-grass diet to predominantly hay without easing in the diet change. You don’t want to decide one day that the paddock is too wet and introduce a stressful major change to your horse’s daily diet and routine. Be proactive and make sure you drive the transition, not the weather. As winter moisture levels rise, start keeping your horse for some periods in its pen, gradually increasing the hay and whatever other feeds you intending supplying. This will not only keep your horse more comfortable, but will extend the length of time your horse will have grass available to it. Once horses are on supplementary feeds, they will spend less time grazing. For most in paddocks, this means queuing up at the feed area long before mealtimes are due – all the more reason to use your lock-up pen, as they won’t be making mud in the paddock. If you are feeding in the paddock, move the feed-out area regularly to keep down the mud. If a horse is permanently confined to barracks, it can easily munch through 12kg of good quality hay a day (less if you’re providing other feeds). Don’t forget a salt lick. If ground conditions are such that you’re turning your horse out for only a couple of hours a day, you should have hay available throughout the day in its lock-up. This means it will graze less aggressively when released on the pasture. A soupy mix of mud and manure encourages the growth of bacteria which can cause problems with your horse’s feet. Mud is your biggest enemy, and better adapted weeds can easily take over where grass used to grow. Some people believe that horses are best without covers. However, in chilly conditions, it only stands to reasons that a covered (and dry) horse will use less energy to stay warm, especially if there is no decent shelter available. An old horseman once reckoned that a cover saved a “good feed” a day. He might be overstating the matter, but a well-covered horse expends less energy, and therefore should need less feed. The cover needs to be warm and watertight. You’re better off with no cover at all than one that’s past its use-by date. Who needs a wind vane when you’ve got a horse? On a windy day their backsides will always be pointing in the direction of the prevailing wind. Good shelter in a paddock can make a huge difference to a horse’s wellbeing and comfort, providing a windbreak on cold days and shade when it’s hot. Growing shelter trees is naturally a long-term proposition, but if you’re in the market for a paddock put adequate shelter high on the list. Like most human endeavours, the more effort you put in, the better the result. The root of most problems on small acreages is nearly always overgrazing, resulting in mud, a lack of grass, and flourishing weeds. By creating a lock-up and starting to manage the grazing more carefully, your horse will not only enjoy better grass, but for more of the year. First published on Horsetalk.co.nz in August, 2006. What are the current fees for grazing horses per head. NOWHERE can I find a DEFINITE answer to this. That would be because each land or property owner would have their own prices for such services! I pay £100 a month for 7 acres for up to 5 horses. I have 3 horses on there at the moment. Plenty of grass year round. We pay £200 a month 3 3/4 acres, 3 ponies. shared with my sister. We have a path that runs nearly the length of the field made of concrete. We need some turn around areas, some where for them to wee, and to roll.